This batch of picture books fulfills four categories for the Picture Book Reading Challenge. They are: #4 a book set on a farm or in the country (Sleep Tight Farm: A Farm Prepares for Winter), #28 a book by Margaret Wise Brown (North, South, East, West), #60 a book by Kevin Henkes (Egg), and # 73 a challenged book OR a controversial book (XO, Ox). I also read books to fulfill #27 a wordless picture book (The Wrong Side of the Bed by Edward Ardizzone), #34. a book about being ME, about being unique, special, loved, etc. (One of a Kind by Ariel S. Winter, illustrated by David Hitch), and # 63 a Caldecott honor (Sleep Like a Tiger by Mary Logue, illustrated by Pamela Zagarenski). Unfortunately these books went back to the library before I had a chance to review them! 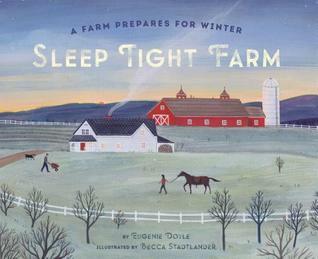 This is a quiet story about all the preparations a New England farm must make before winter weather sets in. I borrowed it from the library for Miss Muffet based on her enjoyment of Christmas Farm. This book is by a different author and illustrator, but the mood and attention to detail are similar. As I suspected, she loved the pictures and enjoyed hearing about the different tasks the family completed before the snow came. We also both enjoyed looking at the endpapers, which show trees with colorful leaves in the front and leafless snow-covered trees at the back. 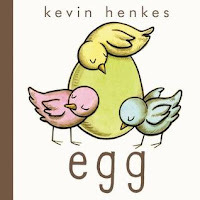 I love Kevin Henkes, but compared with Waiting, which I absolutely loved, this one felt a little thin. The format is interesting, but the "different egg" storyline has been done before and Henkes doesn't really do anything new with it. Miss Muffet liked the book, but it was not a favorite from this particular library haul. I originally thought I would use it for my bird-themed story time, but it's actually pretty difficult to read aloud since there are so many panels and several entirely wordless pages. I ended up using an old Henkes favorite, Birds (illustrated by his wife, Laura Dronzek). I just wanted this one to be better than it was. 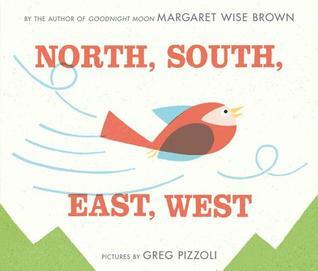 This is an old Margaret Wise Brown story, illustrated with new pictures by Greg Pizzoli. It's the story of a bird who asks his mother which direction is best, and then flies out into the world to find out for himself. The colorful illustrations appealed to both Miss Muffet and my story time audience. The text was a little bit awkward to read aloud, which often seems to be true of these lesser-known Brown books, but even with its strange rhythm and abrupt ending, it was interesting enough to Miss Muffet to warrant a few re-reads. 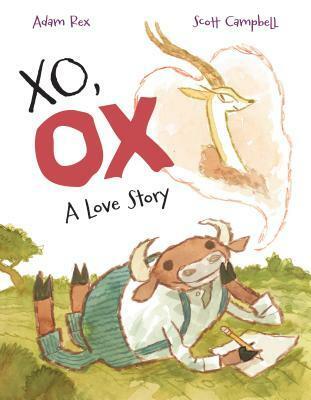 This book is apparently controversial (at least amongst Goodreads reviewers) because the ox is persistent and doesn't accept no as an answer from the gazelle who is the object of his affections. I decided not to apply adult sensibilities to a humorous book for children and found myself laughing out loud as I read this epistolary story of unrequited love. The best line in the book is when Ox calls Gazelle the "unflattering light of his life." The use of language in the story, as well as the unique illustrations, made it stand out for me.